Showing results for "zassenhaus pepper"
Beautiful new in boxes & never used are these Zassenhaus West Germany silverplated pepper mill & salt shaker set. Most of these were made of wood with this set being the rarer silver plated with wood accent set. Originally retailed for $69.95 & $42.95. 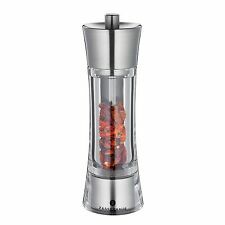 Pepper mill measures 5 7/8 tall to top of wood handle. Salt shaker measures 3 3/4 tall. The top of the pepper has started to tarnish so you may want to polish or leave as is as it has a nice patina effect. eBay ZASSENHAUS Pepper Mill Germany CLEAR LUCITE! 9" Tall ~ Works Great! 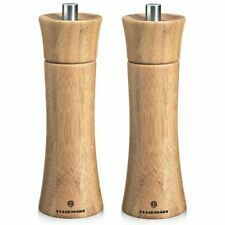 eBay Zassenhaus"Frankfurt" Olive Wood Ceramic Pepper Mill 7"